Let’s create more robust employee engagement! This post originally appeared as a column in Employee Engagement Today. Are you engaged? When we get engaged to be married we are excited and looking forward to our time together. We feel passion and devotion and hope. We don’t have to complete a 12-question survey and wait six months to hear about how engaged we are with our spouse-to-be. We don’t need someone to run us through a training programme. We are engaged. Love, at times, may be blind but let’s not turn a blind eye to the passion and experience of engaged work. We don’t need to become blindly naive to our work but we should experience energy, desire and passion. Do you really believe launching an employee engagement approach with an anonymous survey will start passion flowing? Of course, don’t get me wrong, I am not looking for unbridled passion. We don’t have to bounce around like Tigger from Winnie-The-Pooh but we do need to direct our passion for work into contributions, building relationships and achieving results. Many leaders suffer from employee engagement concept myopia. Upper management and leaders do not see themselves as employees and refer to employees as ‘them’. Them is us and whatever applies to the custodial and call centre staff applies to the CEO and president. 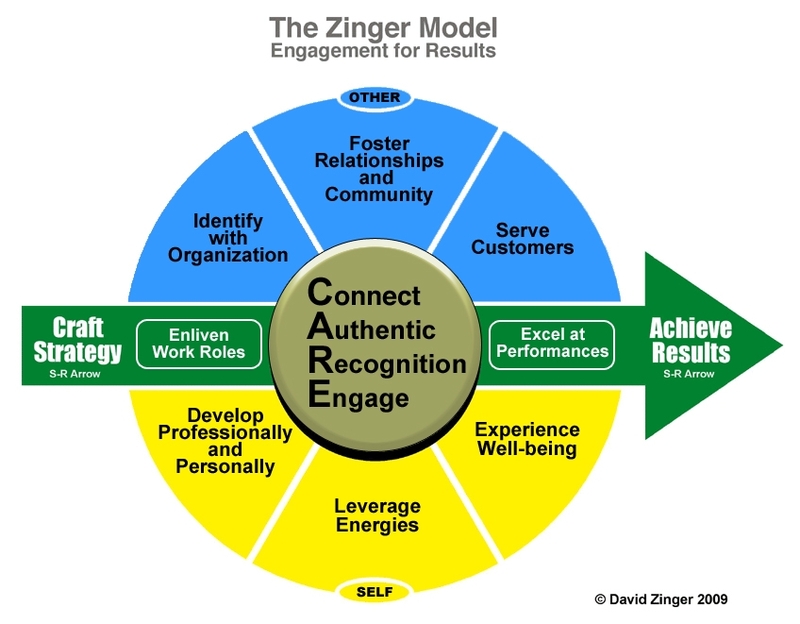 Engagement is not something you do to people; engagement is our connection with people and with our work, regardless of our role or function within the organisation. It seems that our workplaces present engagement as a problem to be solved. That is too anaemic. Yes, there are problems but I think ultimately engagement is much more about an experience to be lived ratherthan a narrow problem to be solved. We don’t need to abandon employee engagement but we need to enrich it. Engagement is about achieving results that matter to all. Ensure that everyone benefits from engagement and ensure employees fully realise engagement is not a management term for ‘sucking out more discretionary effort’ from employees. Don’t house engagement within human resources or internal communication. It belongs throughout the organisation. Yes, you can have a champion and a coordinator but engagement is everybody’s business. Employee engagement is much more than creating a happy dance YouTube video. I believe fun and playfulness can contribute to engagement but if that is how we demonstrate engagement it will never be sustained within the strategic direction and budgets of the organisation. Ensure managers realise that engagement is not an extra on top of far-too-many demands. Help managers and leaders realise engagement is how we manage and lead in this decade. We engage through co-created results, conversation, collaboration, community and high quality connections. Add strength to engagement. There are many pathways to strength identification. Ensure you go beyond identification to helping all employees know, live and leverage their strengths in the service of others, the organisation and themselves. Ban anonymous engagement or disengagement. Engagement requires a name and a face not some anonymous survey. Chase consultants away who tell you they can’t tell you specifically who is engaged or who is disengaged. Engagement is about people – not pie charts or statistics. Engagement must be genuine and authentic. Be like Popeye who declared, “I yam what I yam what I yam”. Let people know who you are. Disengagement is a warning sign for both the employee and the organisation that conversations need to take place and work together to determine what changes need to occur to create more engagement for the benefit of all. Great post David – couldn’t agree more! Too many companies think of employee engagement as something to be done ‘to’ employees rather than ‘with’ them! Likewise – too many employees expect to be ‘engaged’ (by the company) rather than willingly contributing their best and looking for ways to bring their passion and excitement to work. The analogy you use above clearly illustrates that engagement must be 2 way! Yet despite the increase in employee surveys, employer of choice awards and business strategies listing engagement as their #1 objective, the measured levels of engagement continue to drop. I like your thinking that engagement is something we all need to do, with everyone we are in contact with and with more than our own interests at play. When we accomplish that we have community…. Corporate volunteering programs can play a big part in increasing employee engagement. Tons of really successful organizations swear by their volunteering programs and the decreases in turnover and increased engagement they bring. If you’re going to be at NCVS next week, check out this panel: http://bxt.me/ncvsipad to learn more about a new tool: micro-volunteering. Win a free iPad too! The evidence from our research with exceptional leaders is that you increase alignment, engagement and accountability when the leader Just Asks! In working on my book Just Ask Leadership (McGraw Hill 2009) exceptional leaders spend 70 to 80 percent of their time asking questions. In subsequent research we found that most leaders Ask more than they tell 32 percent of the time. This is represents a big gap and certainly explains the lack of employee engagement. I think all of your points are true it just that the prescription I would offer is straightforward – Just Ask! Thanks for the update. I will check into your work. I have been mostly offline for the past few weeks but get some more online time soon.